Liten och smidig HDMI till HDMI Scaler med stöd för 24 fps. The SY-298H24 will allow a HDMI source signal to be up or down scaled according to the screen specifications required. 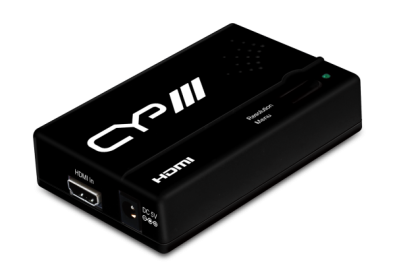 Any HDMI signal inputted can be scaled up or down to between 480i to 1080p, plus PC output resolutions of VGA or UXGA. This device accepts 1080p24 input resolutions enabling content filmed at 24 frames per second displayed. This feature is particularly useful when a 1080p24 source signal is distributed to multiple displays. If any screen is not 1080p24 compatible, the SY-298H24 can be used to scale the input signal to suit the supported screen resolution, whilst not affecting the signal being sent to the 1080p24 compatible screens. This solution is perfect for home cinema enthusiasts who require full native Blu-ray resolutions in their home cinema system, whilst providing signal flexibility to other screens around the home.